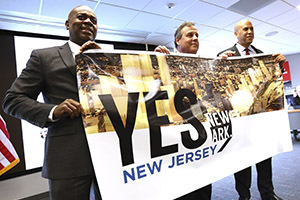 (L-R) Newark Mayor Ras Baraka, Gov. Chris Christie, and U.S. Sen. Cory Booker, D-NJ, at a news conference to announce the state’s Amazon HQ2 application would propose Newark as the location for Amazon’s second headquarters. Governor Chris Christie today joined U.S. Senator Cory Booker, along with state and local officials to announce the State of New Jersey has determined Newark is the ideal location for Amazon’s second headquarters, known as HQ2. The Garden State plans to attract HQ2 with, among other incentives, $7 billion in potential tax credits, mainly based on this development’s expected creation of 50,000 new jobs. Thursday is the deadline to submit proposals to Amazon. New Jersey’s proposal could amount to upwards of $7 billion in potential credits against Amazon’s HQ2 State and City taxes, including an incentive through the state Economic Development Authority (EDA) that could reach $5 billion over 10 years, with the creation of 50,000 new jobs; a City property tax abatement that could be worth $1 billion; and a City wage tax waiver that would allow Amazon HQ2 employees to keep an estimated $1 billion of their hard-earned money over 20 years. The EDA offering is supported by New Jersey’s bipartisan state legislative leaders, Senator Booker and the state’s two gubernatorial candidates. EDA initiatives have worked to help transform Newark into an attractive location for businesses investment, development and growth. Since 2010, nearly 40 projects with EDA support are associated with more than $2.2 billion in private investment, the creation of 5,000 new jobs, 11,000 construction jobs and the retention of nearly 2,000 jobs at risk of leaving New Jersey. You have to be delusional to think that Amazon is going to risk having their employees in a crime ridden slum. Obviously, this is Booker trying to score political points on his home turf when there are plenty of great locations throughout the state close to transportation, highways and safe spaces. Amazon will thrive in Newark and Newark will thrive with our without Amazon because it has the talent, the culture, the history, the tech infrastructure, the location and the leadership driving it to be the smart city of the future. Young, smart people have been moving into and investing in Newark for years. Newark is more than ready for Amazon! Newark will change for the better if Amazon locates there.